It’s beginning to “feel a lot like tech town everywhere I go” as New Jersey’s Capital City continues to be acknowledged nationally as an attractive metro for technology and innovation. The Wall Street Journal’s recent article entitled “Where You Should Move to Make the Most Money: America’s Superstar Cities,” shows New Jersey’s Capital City ranked among the top 12 U.S. metropolitan areas in 2016 by mean digital score; a finding captured by Brookings Institution analysis of federal data. One of the biggest ongoing debates in recent history revolves around the idea of digitization versus human brain power. Given the steady rise in multifaceted technologies, virtues of both physical location and online collaboration have spurred great thinkers to ponder the future of robots and human existence. However, when it comes to talented employees who leverage technology in meaningful ways, Trenton, New Jersey is among the nation’s superstars. According the WSJ article mentioned above, Mark Muro – a Senior Fellow of the Metropolitan Policy Program at Brookings – used data from time-use surveys conducted by the federal government to create an index of every metro area in the U.S., ranking them by how much workers in each city use computers to accomplish their jobs. The resulting data was a measure of the digitalization of every job, industry and city surveyed. Trenton ranked 6th on the list ahead of prominent metros like Washington, D.C., Boston, and San Francisco. 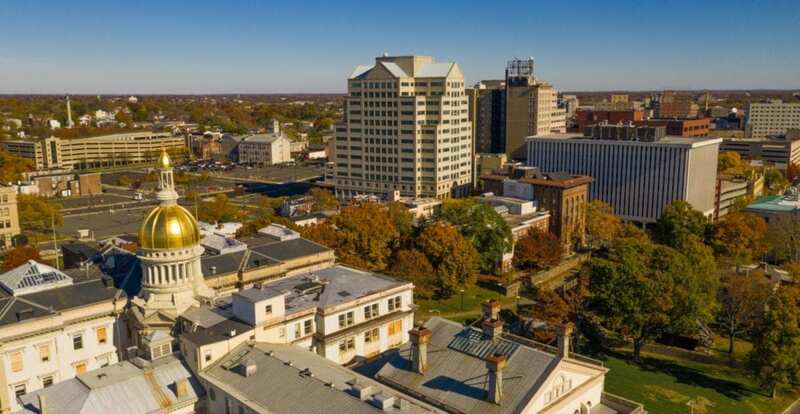 Ranking higher than metros like Arlington, VA (winner of Amazon’s HQ2 location) and Austin, TX (future home of Apple’s new campus), certainly validates Trenton’s appeal as a tech town. Another validation came late last year when Trenton was designated as one of the Top 20 Tech Towns in America. CompTIA’s 2018 Tech Town Index looked at quality of life for tech workers, factoring in salaries, job availability, job growth and cost of living. Instrumental to the city’s talent pool is a consortium of all five anchoring institutions of higher education in Mercer County including Mercer County Community College, Princeton University, Thomas Edison State University, Rider University, and The College of New Jersey. Cities with an abundance of well-educated talent eventually blossom into full-on innovation hubs according to CompTIA. The U.S. tech industry expanded by nearly 200,000 jobs in 2017 to an estimated 11.5 million total workers. Additionally, at $1.6 trillion, the tech sector is one of the largest components in the nation’s economy and is a top-five economic contributor in 22 states. Amazon’s recent HQ2 selection process also revealed some interesting tidbits about Trenton’s attractiveness as a tech town and premier business location overall. After all, a whopping 35 percent of Amazon’s shortlisted cities were located along Amtrak’s massive mainline Northeast Corridor, stretching from Washington, DC to Boston. Central to this colossal route, which is among the highest volume rail corridors in the world, lies New Jersey’s Capital City – an extremely desirable location for many diverse sectors and industries.